Four masters of urban fantasy and paranormal romance plunge readers into the dangerous, captivating world unearthed beyond the dark . . .
New York Times bestselling author Nalini Singh delivers a smoldering story with Secrets at Midnight, as the scent of Bastien Smith's elusive lover ignites a possessiveness in him that's as feral as it is ecstatic. And now that he's foundhis mate, he'll do anything to keep her. 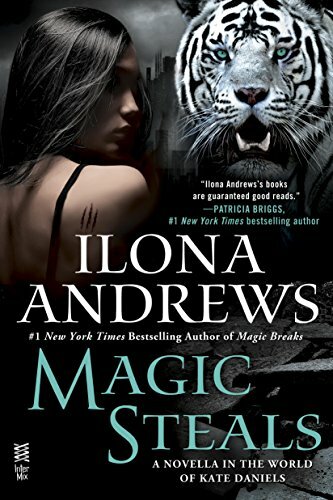 In #1 New York Times bestselling author Ilona Andrews's novella, Magic Steals, when a woman goes missing, shapeshifting tigress Dali Harimau and jaguar shifter Jim Shrapshire must uncover the truth about the mysterious creatures responsible. It's seer Makenna Frazier's first day on the job at Supernatural Protection and Investigations, and her first bodyguarding assignment is more than she bargained for when a leprechaun prince's bachelor party goes every which way but right in national bestselling author Lisa Shearin's Lucky Charms. From Milla Vane - a warrior princess must tame The Beast of Blackmoor to earn a place among her people. Soon she discovers that the beast isn't a monster, but a barbarian warrior who intends to do some taming himself. I'll admit that the main reason I wanted to read this anthology was for the stories by Nalini Singh and Ilona Andrews, I'm a huge fan of both the Psy-Changeling and Kate Daniels series so of course I was eager to be able to dive back into both of those worlds. It was a great opportunity to try a couple of new series though and I have to say that I definitely want to read more from Lisa Shearin and Milla Vane in the future. I'm going to talk about each of these stories individually but I would just like to say that if, like me, you picked up the anthology for one or two authors it's definitely worth giving the other stories a chance too. All four novellas are great and I'd be happy to recommend any of them. I have loved Bastien ever since we first met him so I just knew that his story would be fantastic. He's such a great guy, fun loving and sweet but also incredibly protective of the women in his life as we've seen from his interactions with his sister Mercy. Bastien is currently infuriated though, he has finally caught the scent of his mate only to lose it again almost immediately. As a cat he should be able to hunt his prey wherever they go but the one person he needs to find almost desperately is managing to stay hidden from him. He isn't one to give up though and when he finally manages to track Kirby down there is no way he's letting her out of his sight again. 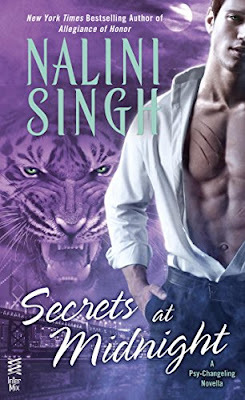 I don't want to say too much more about the story because there was a fabulous twist when it came to Kirby and I really enjoyed watching Nalini Singh reveal it. What I will say is that I absolutely adored this couple and I hope we get to see more of them in the future. This novella takes place over a very short space of time but it's a testament to Nalini's writing that it never felt rushed, I always find her stories completely believable no matter how short the timeline is. Kirby is one lucky girl to end up with a guy like Bastien and I'm definitely looking forward to reading his brothers Sage and Grey's stories. As a fan of the Kate Daniels series I have been rooting for Dali and Jim ever since I read their first novella Magic Dreams so I was excited to see more of them as a couple. This story fits into the timeline during events in Magic Rises while Kate and Curran are off in Europe leaving Jim in charge of the Pack while they're gone. Dali is such a brilliant character, not only is she an incredibly rare white tiger shifter who has an unusual magical ability but she's also the only vegetarian tiger you're ever likely to meet, her eye sight is terrible and she faints at the sight of blood. Basically Dali is the complete opposite of Jim who is the Alpha of the cat clan and Curran's right hand man. I think one of the reasons I love this couple so much is because of their differences though, they compliment each other's characters so well and it's nice to see a lighter, more relaxed side to Jim because of the way he is comfortable enough to let his guard down around Dali. Dali has a lot of insecurities about herself, she doesn't feel like she fits in around the other shapeshifters but Jim is brilliant at boosting her confidence. He is so incredibly sweet towards her and I love the way he doesn't let her keep hiding their relationship. As with the first novella there are some hilarious scenes with Dali and her mother but Jim makes the whole situation even more amusing. This novella has plenty of action, it introduces us to some more of the Indonesian mythology from Dali's ancestry and it has an incredibly sweet romance. I still hope we get to spend more time with this couple in the future but I'm very glad we got a second novella about them. The first book in Lisa Shearin's SPI Files series (The Grendel Affair) has already been published but I've not read it yet and Lucky Charms is a prequel to the series so you're fine to start here. This story introduces us to Makenna, the new Seer who has just joined the SPI (Supernatural Protections and Investigations). Makenna's first job is to track down a missing leprechaun prince and the rest of his bachelor party after they escaped from their previous bodyguards. The leprechaun's have no intention of coming home quietly though - not when there is a whole city of trouble waiting for them to find it. This story was very light hearted and a lot of fun to read, the world Lisa Shearin has created is full of a wide range of magical creatures (Makenna's boss is a vampire and the CEO is a dragon!) and it's one I'm looking forward to exploring further. There was plenty of humour and I loved the banter between Makenna and the rest of the team she was working with. I'm very curious about her partner Ian and definitely planning on reading the rest of this series - in fact I've already ordered my copy of The Grendel Affair and can't wait to start reading it. Mala is a warrior on a quest from her Goddess to tame the Beast of Blackmoor, she will do whatever it takes to achieve her goal because her people are depending upon her to protect them and she needs the Goddess's gifts to help them survive. What she doesn't realise is that the Beast is in fact a man and Kavik will do anything to avoid being enslaved again. Kavik angered Mala's Goddess so it's not too surprising that she has forsaken him but Mala believes that they can both earn redemption for themselves and their people if they only listen to the Goddess and follow her will. I believe that The Beast of Blackkmoor is the first in a new series from Milla Vane (who you may already know under her other name Meljean Brook). This was very different to anything else I've read from this author and in a way it seemed like a bit of a strange fit for this anthology. The first three stories are UF and PNR where this is a straight fantasy and it's much, much darker than the others. I still enjoyed the story and would definitely read more if this does turn into a series but it just wasn't at all what I expected and I can see why some people haven't liked it as much. Milla Vane has created a dark world, one where you will see characters raped, beaten and tortured so its probably best to be prepared for that going in, but I really liked the main characters and enjoyed seeing them fight for their freedom and the lives of their people. This won't be the story for everyone but I'd recommend giving it a try because it might just surprise you.